Follow the links for event recipes and examples to help you host these topics in your own city. TechSoup, the parent of the NetSquared network, has helped one million nonprofits save over 11 billion dollars. Help us tell the story and encourage more NGOs to create their free accounts with this 10 minute mini-presentation. 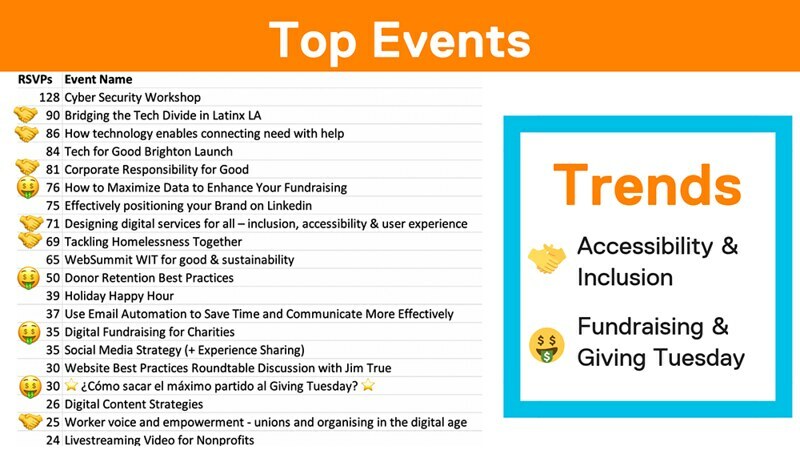 I've created slides and presenter notes to make it easy to open any meetup with a reminder about how TechSoup can help your members. The power of the NetSquared network of organizers is that we're here to support each other. We build on each other's work and share best practices. Erica Woods, who has started TWO NetSquared-affiliated meetups, is sharing her tips for building a strong meetup on the TechSoup blog. Let's help spread the word (and recruit new leaders while we have access to TechSoup's global audience!) by sharing the post on your Facebook, LinkedIn, and Twitter. I host a @techsoup-affiliated #Tech4Good meetup and it's an amazing way to build community and grow your reputation. Want to start your own NetSquared #Tech4Good meetup? Apply now.